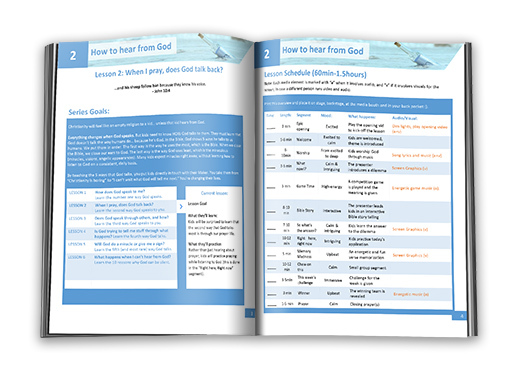 Seven jam-packed curriculum lessons for ages 6-12, teaching kids how to transform their lives by learning to hear from God. How does God talk back to us humans? And how do you teach a kid to hear God’s voice? This isn’t an easy topic to teach. Many adults struggle with it themselves. But it’s CRUCIAL that kids learn to hear God’s voice. Christianity is just another religion, unless God speaks. The Bible is a boring book to kids, unless God speaks. Church is just a ritual, until God speaks. Many kids know how to talk TO God, but they DON’T know how God talks BACK. So they imagine all kinds of mystical things. This series will ground them, as you teach the five ways that God talks to us. This may well be the most important topic you’ve ever taught. After all, you’re putting kids directly in touch with their Creator. What a privilege! God wants to talk to your kids every day. Teach them how! This series has you teach interactive Bible Stories. At every paragraph, kids have to perform a fun action, making the Bible telling fully interactive and fun. They won’t be sitting on their chairs, they’ll be moving around the room as they hear the story unfold. Kids learn the number one way God speaks: through the Bible. They’ll see how king Josiah found a missing scroll, and how it changed the king’s life forever (2 nd Kings 22). Many kids know that God talks through the Bible, but not how it works exactly, so they’ll practice it; right there in the room! When I pray, does God talk back? Kids learn the second way God speaks; through prayer. They’ll understand what a prayer life is; it’s more than rattling off a wish list! After seeing how Nehemiah heard from God through his prayer life, kids will practice it by kick-starting their own prayer life. Does God speak through others, and how? If God told us everything we need to know, then we wouldn’t need others. But God chose to speak through others. Often, those “others” don’t even realize it! Kids witness how king Rehoboam lost his kingdom because he didn’t listen to God through his advisors (1 st kings 22). Is God trying to teach me stuff through what happens? God opens doors nobody can close (Rev 3:7-8). This concept of open and closed doors is often misunderstood. What if God calls you but it seems that he closed the door? Kids will learn all about this by puzzling through different scenarios. Will God do a miracle or give me a sign? Jesus avoided the miracle-seekers and when he was asked for a sign, he didn’t give it. But at the same time, God does miracles all the time. Kids will learn the difference between asking for a miracle (for healing, for instance), and testing God, which is wrong (Luke 4:12). What’s happening when I can’t hear from God? 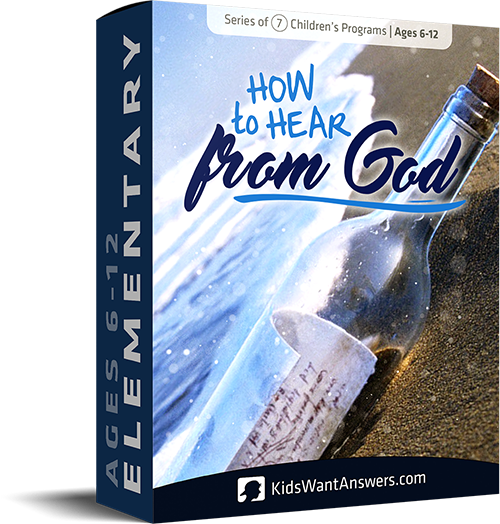 This series wouldn’t be complete without telling kids what’s going on when they DON’T hear from God. The first cause is when God tests you. During a test, the teacher is quiet. Kids will learn to trust God in those seasons. In the final lesson kids will learn the second reason why God can be silent; it’s when our heart isn’t right with God. The Bible gives 10 different reasons for a “block” in our prayer life. Kids will review them and also learn how to solve each of them. Almost all games involve all kids, no matter your church size. It’s scalable from 8 to 3000 kids (It’s tested up to 3000). Have you noticed? Normal handouts don’t work anymore! Kids just throw them in the trash. So let’s step it up a notch! 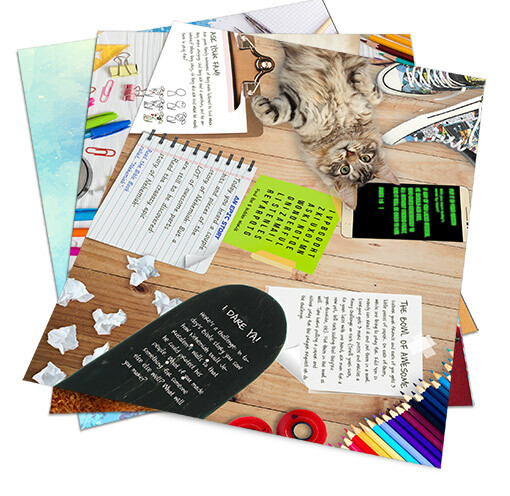 We’ve custom-designed handouts that kids actually want. This way the lesson goes on at home. These glistering handouts are full of fun activities, challenges, family involvement and even Biblical entertainment. Yes, print as many as you need. Always organized: A lesson’s screen files come in one handy folder, all neatly numbered in the order of the lesson. Never lose anything: Log in to our system at any time to re-download your purchased series! No failing DVDs: DVDs get lost, scratched up and don’t work in every player. It’s time to leave them in the 90s where they belong.